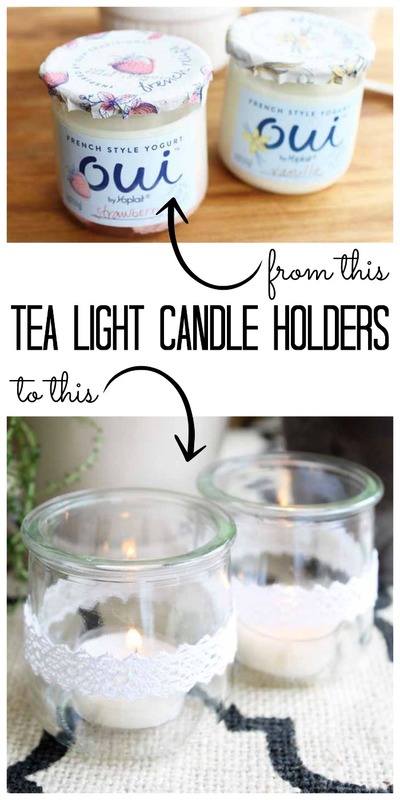 You can make tea light candle holders from recycled materials in minutes. I recently found a new french style yogurt and it comes in the most adorable little glass jars. Yep. I just had to come up with a way to recycle those container into home decor. There are so many things you can do with these cute jars but I am taking a few minutes to decorate them for some tea lights. These jars are just too cute to pop in the recycling bin. I had to upcycle them into something useful for my home. The yogurt is pretty good too y’all! So you might want to pick some up to create this project. Start by diving into the yogurt then wash out your containers well. The labels are easily removed so in no time at all you can have glass jars just begging to be recycled into some craft projects. The only other supply you will need for this craft is some doily tape. I love the romantic feel of this tape and yes it is self adhesive. 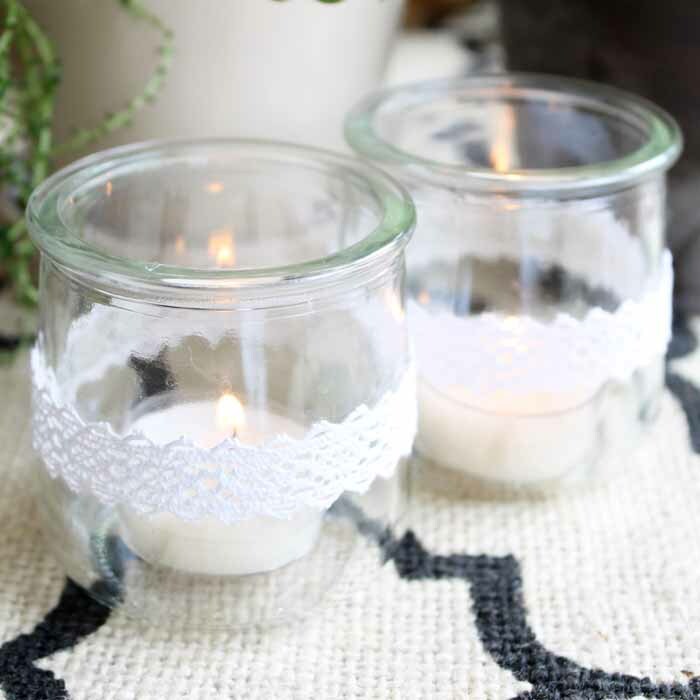 So you just have to cut off some doily tape, peel the backing, and wrap it around the jars to create some fun tea light candle holders. Want to see just how I did it? Then watch the super short video below to get all of the details! So super easy right? 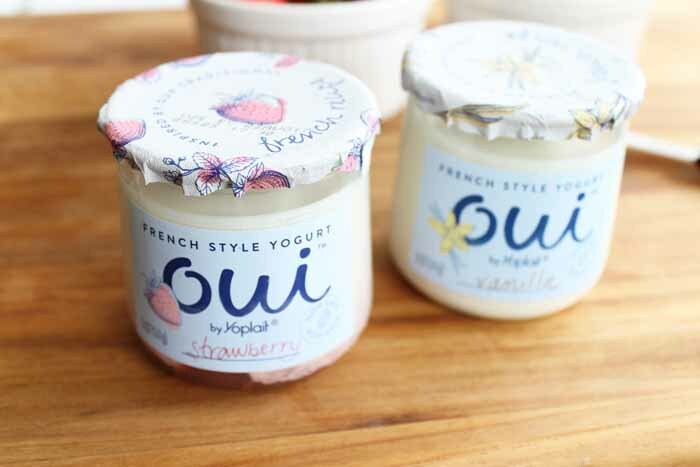 Just add Oui by Yoplait to your shopping list this week. You will love the taste and texture plus the bonus of those adorable jars is just too much to pass up. What will you recycle them into? Some tea light candle holders or something else entirely? Love these and want more project ideas? Try the links below! 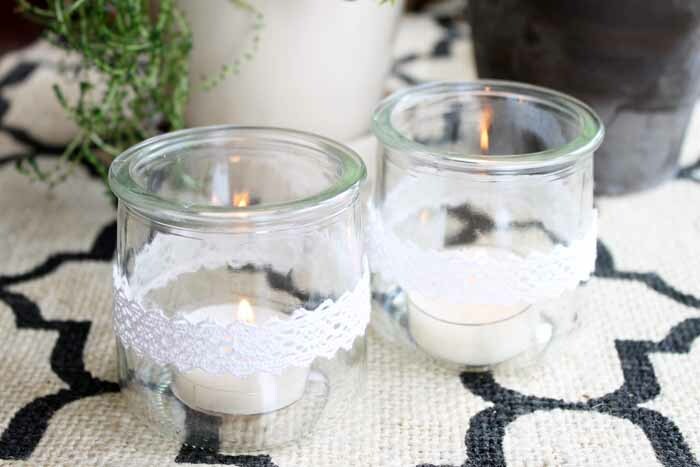 Those little jars are too cute, love them for tea light holders. Leave it to you Angie to see that. Perfect size for tea lights. Never heard of doily tape but will look for it. Will look for OUI yogurt. Grand Junction area is terrible about getting new items of any kind, very annoying. Every time I get on your blog you have something new to make,look for to use. I love reusing pretty jars and bottles. This is a great idea. Cute and simple, my kind of project. I’ve been stockpiling a couple of these jars for crafting – I love this simple idea! Thanks for linking up with Merry Monday – I’ll be featuring your candles at our upcoming party! Brilliant idea, they look so sweet. This is so great. Love this little idea, at this price you can have all you want for around the tub etc. These are so adorable! and Very clever! Thank you for sharing at Celebrate It! Now I am off to find this yogurt! How cute! I love fun upcycle projects. Thanks for sharing with us at Snickerdoodle.